I made this cake for my friends Cat and Steve's seaside Autumn wedding in Poole last year. 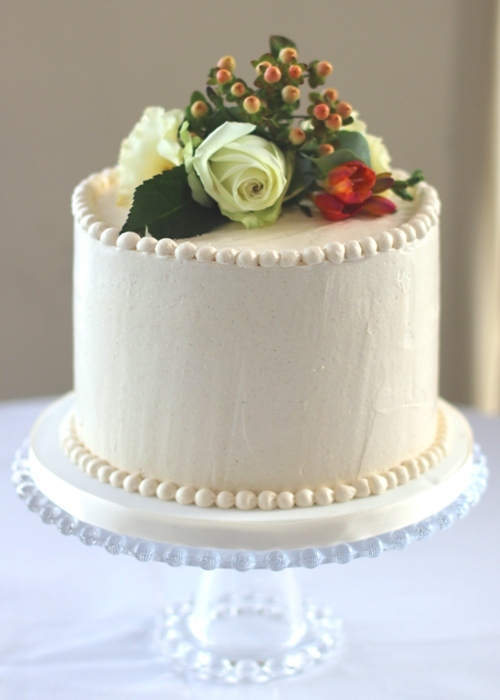 I love the combination of a simple iced cake decorated with fresh flowers (especially as these ones have such a pretty, warm palate). Inside are 6 layers of chocolate cake with a cinnamon spiced swiss meringue buttercream. It was so nice being able to walk on the beach, catch up with uni friends and warm up with hot chocolate over the weekend. Congrats to Cat and Steve! Simple, charming...and delicious, I'm sure! that's so beautiful.. love the simplicity of its. PS. have to say I read it at first glance as a wedding for Cat Stevens... that would be amazing!